Conservation can add many layers of savings, often as a result of a single change on the farm. Consider the switch from sprinkler irrigation to drip. 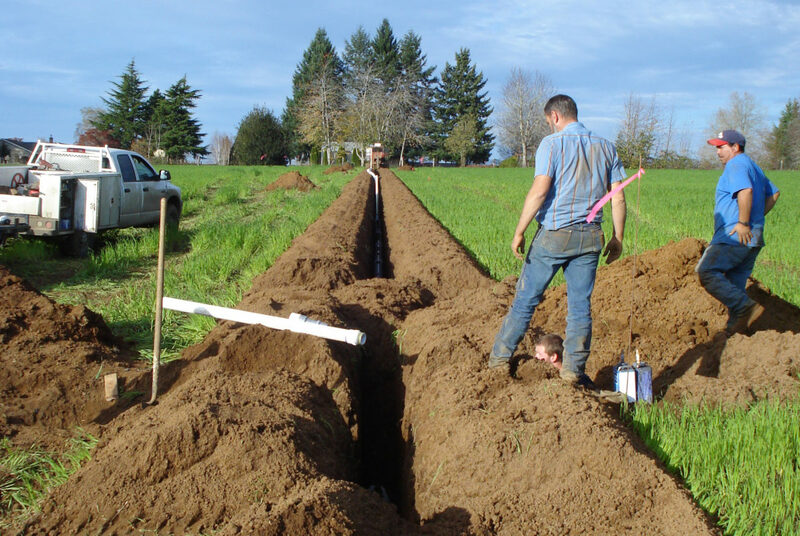 There are economic savings that include eliminating the labor of repeatedly moving pipe, as well as the reduction in pumping costs due to improved irrigation water application in the field. If you decide that you really want to maximize the efficiency of that new drip system, you can implement a soil moisture monitoring program and begin irrigating only when crops need it (as determined by soil moisture monitoring). You’ll see those pumping costs drop even further! There are also some significant water quality and quantity benefits that come from converting to drip. As illustrated above, applying water only when and where it’s needed drastically reduces the amount of water you’re using overall. This means more water stays in the creek (or in the ground) to be used by fish and other critters. As you’re irrigating according to soil moisture levels, you’re now also eliminating erosion caused by over-irrigation. This has a threefold effect. First, you’re keeping herbicide, insecticide and fungicide contaminants out of the creek. You’re also keeping fertilizers out of the waterway. And lastly, your soil stays in the field where it belongs and it doesn’t muddy the water! These same types of comparisons can be made with a number of conservation practices. Taking a minute to identify the problem areas of your farm (assuming there are any) and developing options to treat those problems will allow you to work smarter, not harder, all while maintaining soil and water quality. This is exactly what we here at the East Multnomah Soil and Water Conservation District want to do. We would like to volunteer to work with you on developing common sense solutions to any problems you may be having and help avoid problems in the future. And to ensure that all your work in planning comes to fruition, we have a grant program that provides you with dollars to offset the cost of implementation. It’s kind of a no-brainer really. We’ve seen this process work over and over again and hope that you will see the benefit as well. The best part of all this is that it only takes an email or phone call to get started. Ultimately, conservation planning and the implementation of conservation practices is a win-win for your bottom line and for Mother Nature. Need help with your land? Put us to work for you! Request a site visit here!